The dark and stormy is a popular drink from the tropics that is just as refreshing as those fruity rum drinks; it simply takes a different spin on what is considered tropical. It is very easy, and if you have fallen in love with the Moscow mule, then you need to give this one a try. This is a very simple recipe, and all you need to make a great dark and stormy is a good dark rum and a nice ginger beer. Some bartenders will add lime juice as well, but it is not needed. In fact, if you want this drink in its true Bermudian style, then you would skip the lime. If you like, try floating the rum on top of the ginger beer to create a layered dark and stormy. You will notice that this recipe uses two very specific ingredients and calls them out by name. 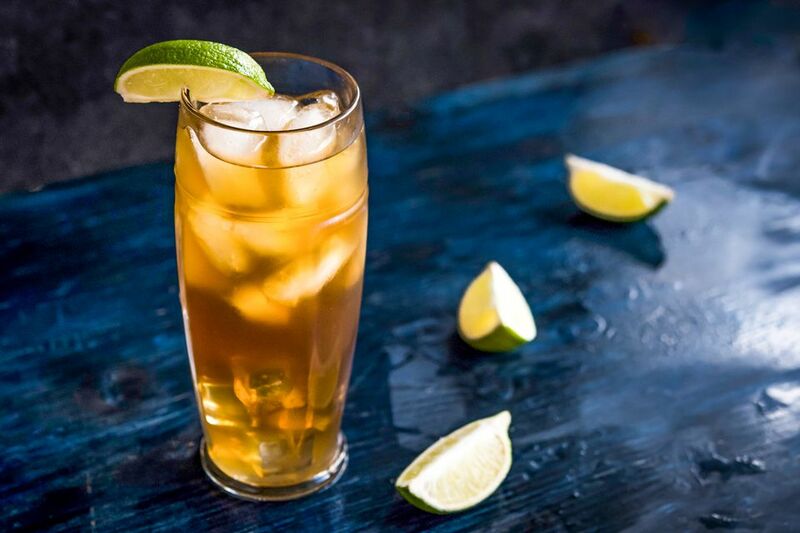 That is because the dark and stormy originated in Bermuda and Gosling's Black Seal Rum and Barritt's Ginger Beer are both produced on the island. For a real taste of this cocktail, go with these brands. Apparently, Gosling's has trademarked the dark and stormy, and legally it should only be made with their rum. The rum producer even filed a lawsuit against Malibu Rum in 2015 for an "unauthorized" cocktail that was a play on the original recipe (mixologists and brand ambassadors beware!). That said, the dark and stormy is also a great cocktail when made with any other combination of dark rum and ginger beer and there are endless possibilities available. For the rum, make sure that it is a dark rum. One that is rich and flavorful and preferably from the Caribbean will be best. You want to give this cocktail some oomph and a white rum, even a golden aged rum, will simply not create the same background. Do not use a spiced rum in a dark and stormy. The ginger beer already has the spice profile covered, and there is no need to repeat that aspect. In fact, it produces a pretty bad drink and the one time someone gave me one, I could not get past the second drink, and I love ginger beer! Barritt's is (according to the brand) "Bermuda's Favourite Soft Drink" and is the choice for an authentic dark and stormy. It is a sweeter ginger beer and is better as a cocktail mixer than on its own. However, it can be difficult to find, and you may have to look hard to find it locally. It is interesting to note that in Gosling's official recipe (complete with trademark symbol) they use their own ginger beer called Gosling's Stormy Ginger Beer. There is no mention of Barritt's. I have had many dark and stormy drinks with many ginger beers and, quite honestly, you cannot go wrong with any of them. For me, the rum is far more important here. Barritt's is great, but I enjoy that hard spice of the Jamaican ginger beers. It is also a nice drink with the newest ginger beers that are designed for mixing like those from Q Drinks and Fever-Tree. What Is the History of the Dark N' Stormy? So many of the stories behind the great drinks we enjoy are a little hazy, and the dark and stormy is no exception. Like Navy grog, it does have something to do with the British Royal Navy and sailor's rum rations of the 1800's. Much of this rum was among the blackest Caribbean rums they could get a hold of, and when Gosling's began marketing their version around 1860, it became one of those favored. For some odd reason, the Royal Navy also began producing their own ginger beer around this time and as David Wondrich puts it on Esquire, 'The swabbies, given a choice between Demon rum and temperance beverage, said, "Fanx, gov, we'll take both.'" How Strong Is the Dark N' Stormy? If we were to mix a dark and stormy as prescribed with Gosling's and Barritt's and no lime juice, then it is a relatively mild mixed drink. Gosling's may be dark, but it is still just 80 proof so the finished drink would weigh in at right around 15 percent ABV (30 proof).